1Trim the stems of spinach and clean them well in cold water. I find that filling the kitchen sink with lots of water and then submerging and rinsing the spinach works well in cleaning out the mud and debris. Drain. Roughly chop and them place it in a steamer. 2Steam for 5-8 minutes or until the leaves are wilted. 3Drain. Squeeze out the excess water from the spinach. This step is extremely important to avoid a soggy filling. set aside. 4Take a skillet and heat 1 tsp of Olive oil and saute the onion until tender. 5Add the spring onions and cook for another 2-3 minutes. 6Remove from heat and then add the spinach, herbs, cheeses and nutmeg. Season with salt and pepper if required. You can taste it to see if it does not have enough salt from the feta cheese. 7Preheat the Oven to 350F (or 180C). Place the 3 sheets of filo at a time (keeping others covered to avoid drying out). Mix the butter and 2 tbsp Olive oil in a small bowl. Brush each sheet with butter mixture and lay on top of another. 8Cut into equal thirds lengthwise. 9Spoon a little filling on an angle at the end of the each strip. You don't want to be overzealous here with the portion since it will slip out later. 13Repeat this process until you reach the end. 15which you can grease with little butter mixture and stick to the pastry. 16Brush the top lightly with butter mixture. 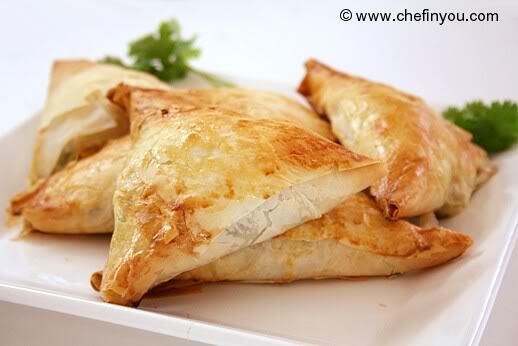 Grease two baking sheets.Bake the triangles for 20-25 minutes or until the pastry is golden brown. Don't count on leftovers! I assure you, you would be hard pressed to have any left!